It is October 31st. 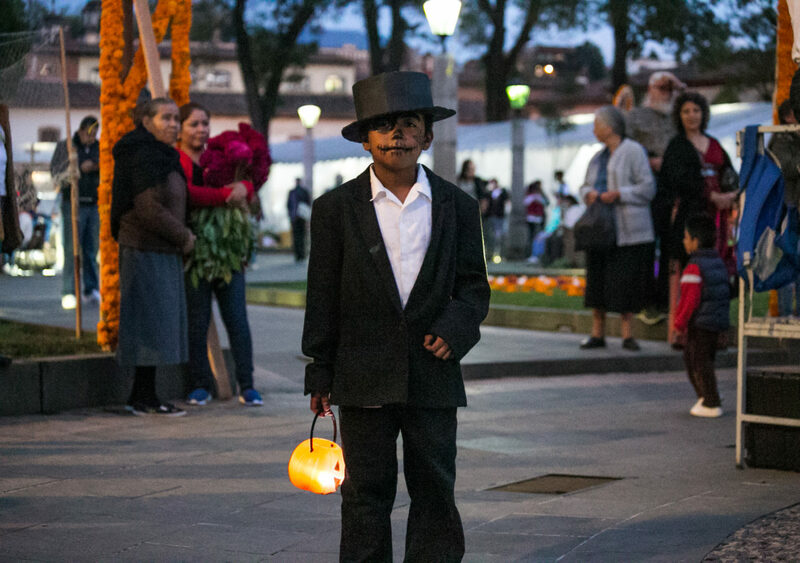 Children skip through the 600-year old streets of Patzcuaro, Mexico, collecting candy, as families, business owners, and churches prepare for the annual Dia de los Muertos celebration the following day. Vibrant orange marigolds hang from every tree, archway, and sign in sight. The mouth-watering scent of cooking elotes drift across the town square, as traditional dancers bound amidst the hanging globe lights. 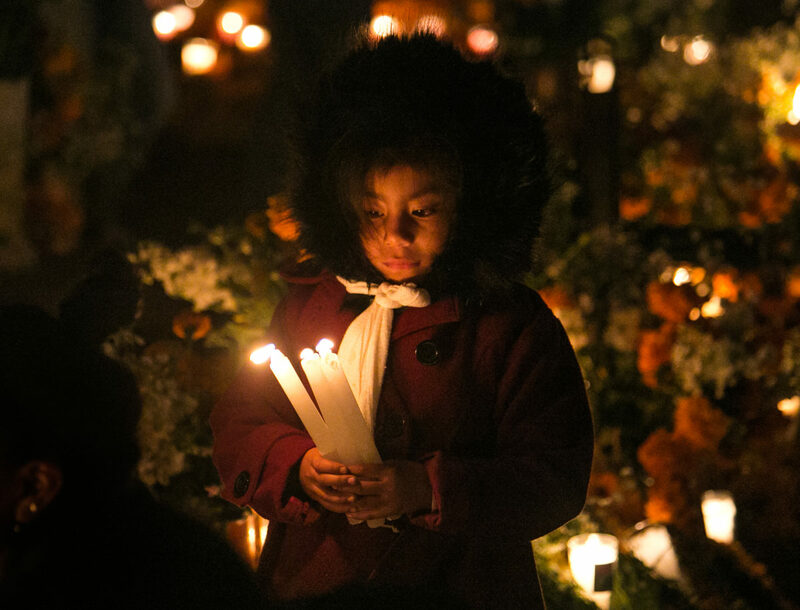 Patzcuaro is known for its rich and traditional celebration of the holiday, and this is just the beginning. 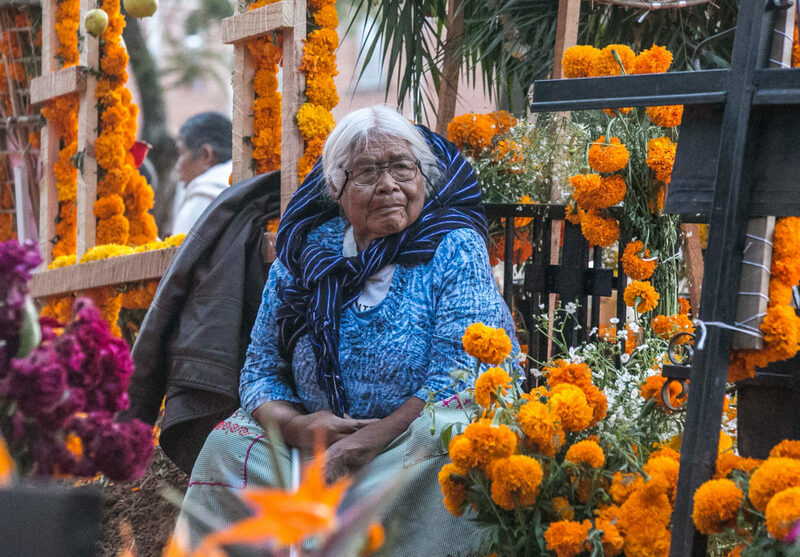 Dia de los Muertos, or “Day of the Dead,” is an annual celebration deeply rooted in Mexican tradition, family values, honoring the deceased, and respecting your elders. The celebration is commonly misunderstood—being incorrectly associated with Halloween, pagan rituals, and costumes. This unfortunate and inaccurate perception is likely a result of selective media coverage and pop culture influence. This will set the record straight. The preparation is an all day affair. Schools are closed, and everyone lends a hand. By late morning the town center is filled with students, parents, and community leaders all working together. At the center of the square large and artfully decorated altars surround the fountain, each representing a neighboring community, and memorializing their loved ones. 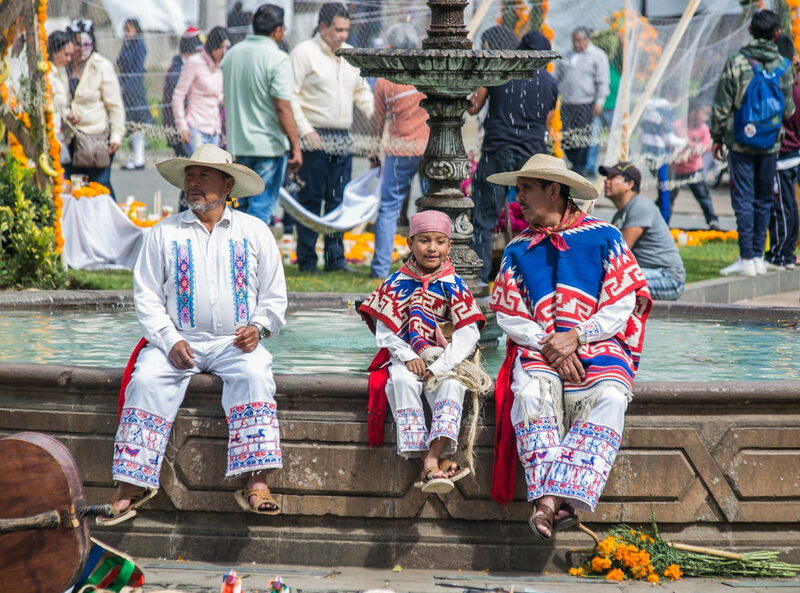 Dancers, dressed in traditional performance-wear, take a break on the side of the fountain in the Patzcuaro town square. 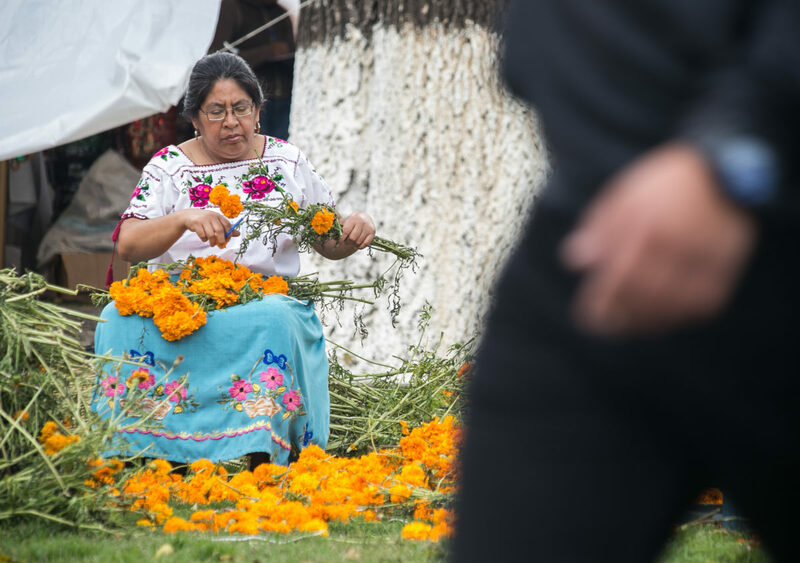 A woman from the neighboring town of Santa Fe helps to trim Marigolds in preparation for the festivities. A family of tourists from Canada take a selfie in front of the marigold-clad town sign. By now thousands of marigolds have been meticulously placed in every nook and cranny, twilight has set in, and the warm glow of candles illuminates the city center. With the evening festivities well underway, the only masks and costumes are on children or wandering tourists. Here, Mexico celebrates differently. A crowd packs the square as local high school students begin a show of traditional harvest dances. The graceful performances honor the deceased, the upcoming crop, and the prolific fish population in the lake surrounding Patzcuaro. 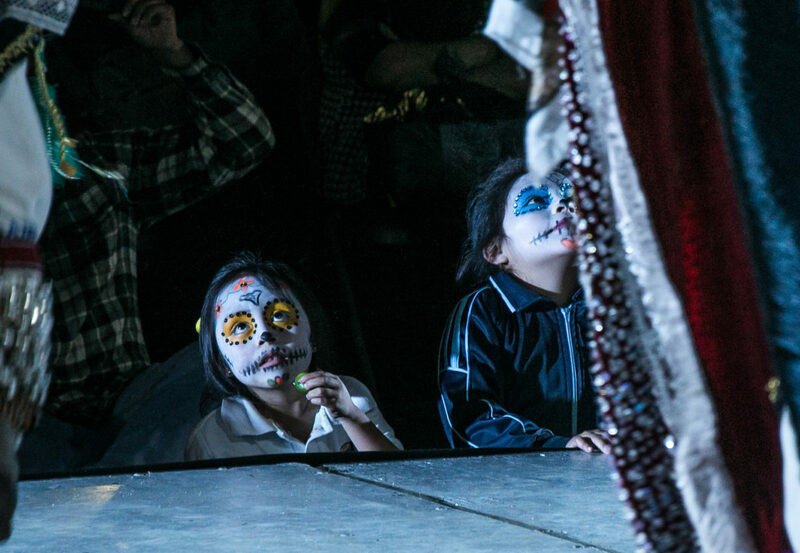 Children watch with wide eyes as the brightly colored dancers light up the night. A child sits at the edge of the stage as dancers bound above her. A young boy pauses during his feverous search for candy on all Hallows Eve. Each family constructs an altar around their loved one’s grave site. The altars serve as a portal for the dead to enter the world of the living during the festival period. These memorials are quite expansive consisting of wooden frames, thousands of marigolds, and prolific offerings of food. There are three shelves of food representing heaven, earth, and the underworld. Items honoring the saints of the Catholic Church are placed on the top shelf, while favorite foods and personal items of the deceased are placed on the lower shelves. It is believed that the cross of salt at the base helps purify souls as they cross into the world of the living. The candles and marigolds help guide the souls with their bright color and strong scents. The evening festivities end early to allow families a little rest before the 24-hour celebration beginning at sun up. The square is quite, the candles flickering in the breeze on this cool Hallow’s Eve. The street of every small town surrounding Lake Pátzcuaro is packed with people—each with a specific place to be. 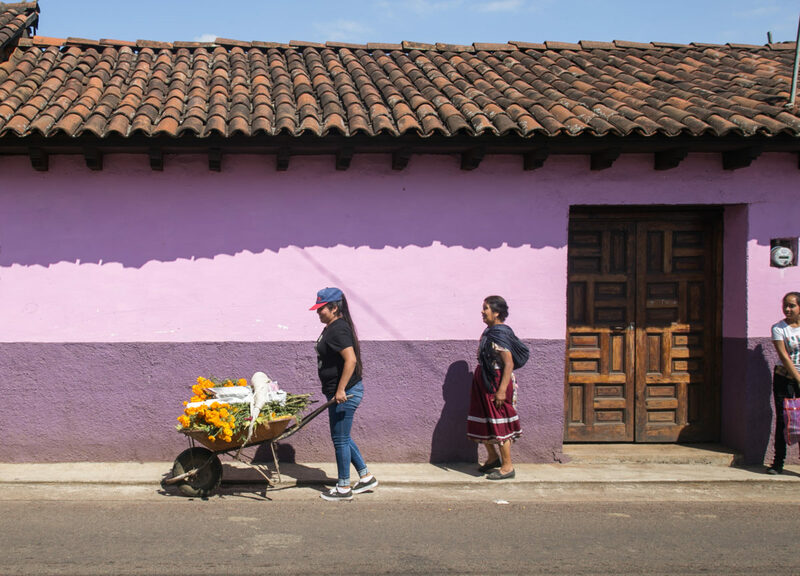 Karla Cortes, of San Francisco Uricho, leaves her home with a wheelbarrow of marigolds, coffee cans, and candles. Karla, her mother, and sister, take this same walk every year, and will spend the afternoon decorating several of their family member’s grave stones. A few towns away, Luz Marie picks marigolds behind the local church in Santa Fe. She will later take her trimmings to the market with her daughter. This is a common practice due to the immense demand for flowers every year at this time. 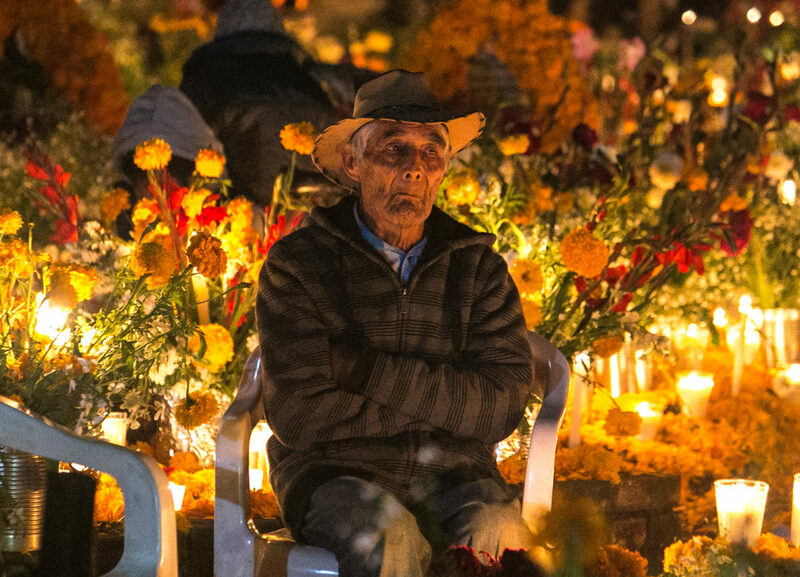 Luz and her daughter will visit the cemetery at night after all the flowers sell. 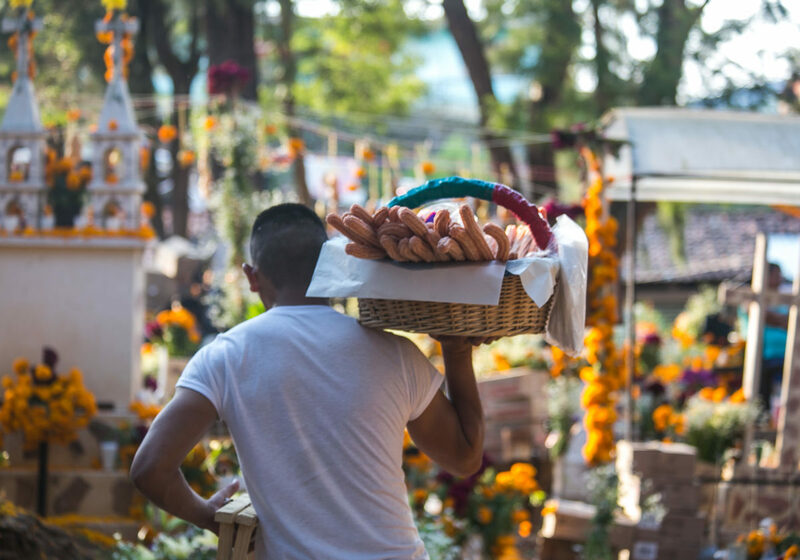 Elsewhere, families work tirelessly, creating some of the most elaborately decorated grave sites in all of Mexico. 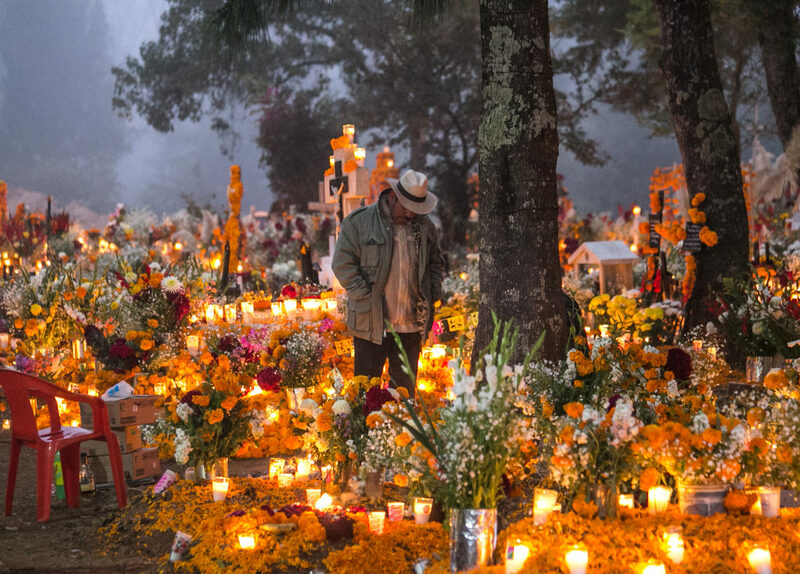 The cemeteries are packed—it’s impossible to enter without dodging several bushels of marigolds and a mariachi band. Spirits are high, and families reminisce together over homemade dinners as they prepare for the evening. A vendor walks amidst the graves yelling, “Hot churros! I got churros!” This is the side of Dia de los Muertos that not many see. The holiday is known globally, but its reputation is mostly bright skeleton masks, and parades. This is because media and pop culture have conditioned the pubic to associate these things with the holiday. Perhaps the largest recent influence is James Bond: Spectre. 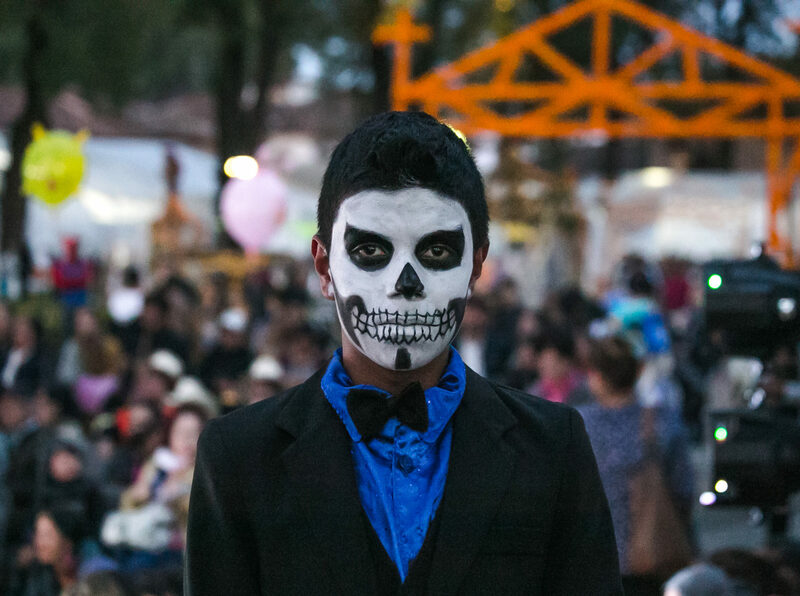 The film features an intense chase scene through the center of Mexico City during a Dia de los Muertos parade. Before Spectre, parades like this did not exist. It was fabricated for the filming, and now represents a permanent fixture in the tradition. 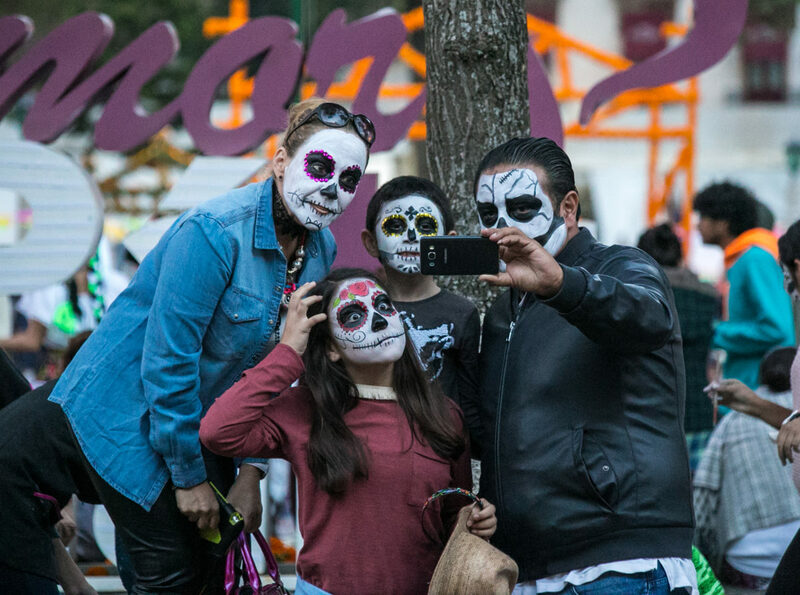 After Spectre, and an immense boost in tourism for the festival, Mexico City made the parade an annual event. The modern festivities quickly spread to other cities and towns across the country. A holiday dating back thousands of years has been altered by James Bond. A churro vendor walks amidst the gravestones in the local cemetery. 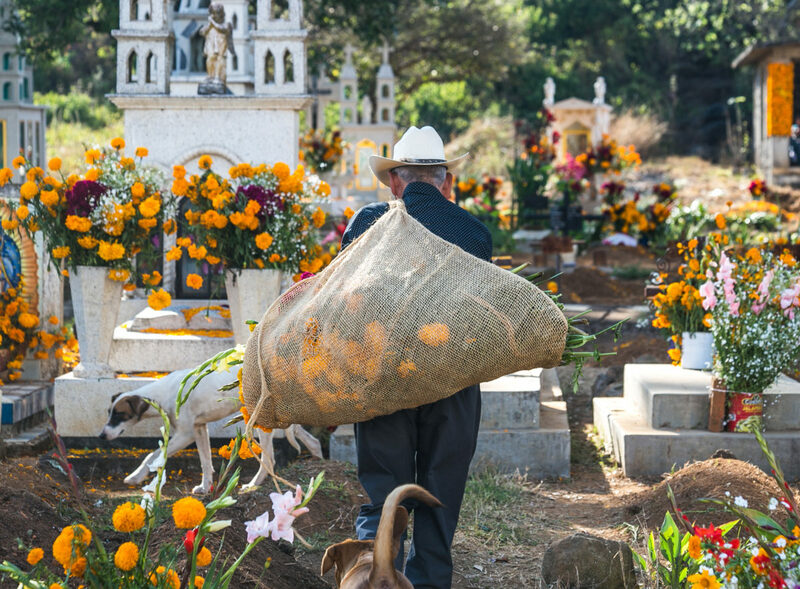 A man carries a bag of freshly picked marigolds through the cemetery. Sunset is moments away. A jovial energy reverberates throughout cemetery as the sun lowers in the sky. A distant sound of a thunderous brass section can be heard drifting down the main street of Tzintzuntzan. As the sun dips below the horizon, a parade of hundreds roars down the main street with jubilant conviction. The traditional parade is comprised of families from Tzintzuntzan, and leads to the public service for All Saint’s Day in the town park. This parade is much different from the one in Mexico City. In this procession there are no costumes, painted faces, or skeleton floats. Instead there are large wooden frames plastered with marigolds, photos, and belongings of the town’s deceased loved ones. The men holding the frames dance furiously as the mariachis guide the crowd with the smooth resonance of their horns. The procession reaches the center of town, and turns into the town park with a large crowd in tow. Everyone gathers at a stage in front of the church, and moments later a priest emerges to deliver a stentorian sermon. After the service concludes, the parade continues directly into the cemeteries. A woman gets settled for the night as the sun sets in the Tzintzuntzan cemetery. As darkness settles over the gravestones, flicks of lighters exploding in the night as the cemetery came alive with the warm glow of candlelight. At this point families were fully settled in – relaxing in lawn chairs and enjoying time with one another. Plates of food, musical instruments, and bottles of tequila are being passed about in a joyous celebration. 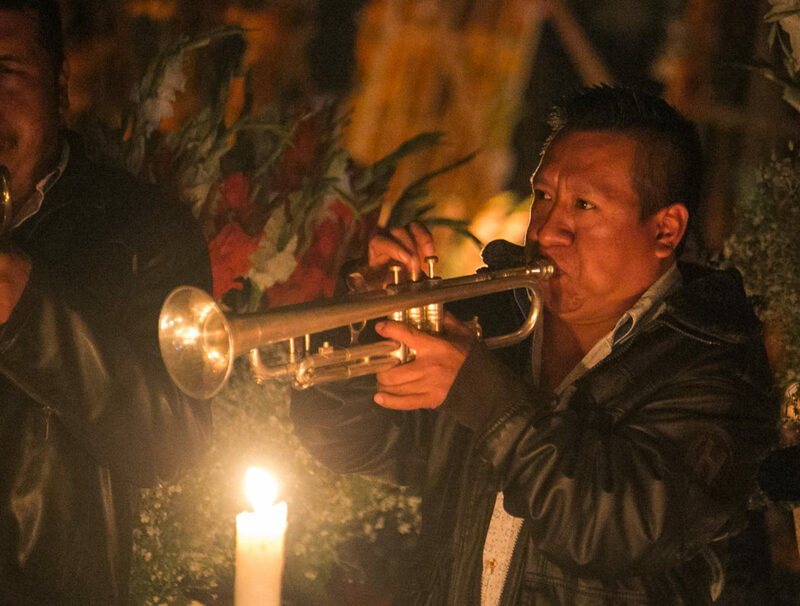 The trumpet player of mariachi band plays in Tzintzuntzan cemetery. A man relaxes next to his wife’s gravesite in Tzurumútaro cemetery. Many families invite mariachis or brass bands to follow them throughout the night. Families lead the procession, carrying the large wooden altar face above their heads from the evening service to the cemetery. The bands follow behind, calling out to the deceased with an ensemble of horns. When families arrive at the gravesite, musicians surround them as they set up the altar face, light the candles, and burn copal (or incense). The copal aroma is said to purify the souls of the dead as they enter the world of the living. The mariachis serenade the family for the next hour as they call upon their loved ones. After they leave, the family settles in to eat, drink, and reminisce. 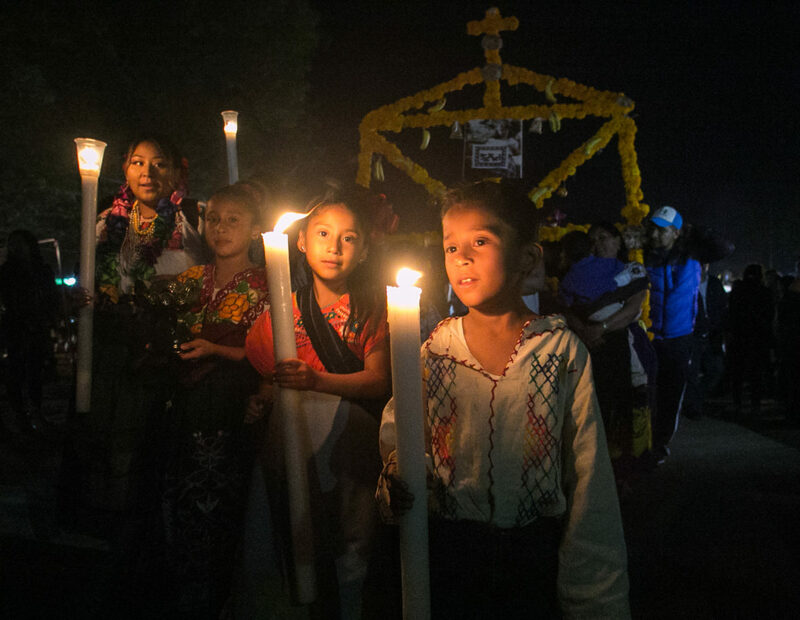 A girl plays with candles near her family’s gravesite in Tzurumútaro cemetery. Tourists and onlookers thin out by 1:00-2:00am – only the families and friends of those buried beneath our feet remain. Small groups form across the cemetery – some starting fires, cooking food, or playing cards. The mood is warm, and reflective. Everyone is enjoying themselves, laughing amidst the thousands of flickering candles. As the clock pushes past 3:00am, many families pack up, taking their children home to bed. Only a small but distinct group remain: those that feel they still need to be here. Those that want every last second with their wife, their mother, their brother. As the sun rises through the trees, in humbling unison, final prayers are uttered, and those remaining leave the cemetery. One of the few men remaining in the cemetery when the sun fully came up. As some were just heading home to sleep, others were waking up to return to the cemetery. The streets and markets are packed wall-to-wall with people carrying marigolds, food, and supplies. November 2nd is Day of the Dead. Families often tend to their loved ones’ gravesite in the morning, before spending the remainder of the day together eating, drinking, and having small memorials. Like the day before, the morning visit is a family affair, and can involve replacing flowers, redistributing petals, changing the water, and replacing burnt-out candles. Three generations can be seen planting a marigold together atop a fourth. Mariachi bands are heard from every direction as children skip down the flower-clad aisles of mausoleums. Are the parades and Hollywood movies a bad thing? Not at all. 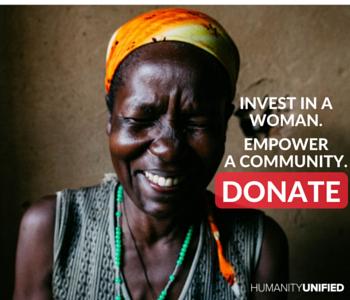 They provide a culturally-relevant event for locals and tourists to enjoy together. They help to spread general knowledge of a holiday many did not know about 40 years ago. With that being said, we must remember to look past the masks, and see Dia de los Muertos for what it truly is—a holiday of family, community, and deep tradition. About the author: Michael Schwartz is a freelance photojournalist and the founder of Wicked Pittsburgh Art Collective, a non-profit collective of 45+ artists that gives 20% of all art sale revenue to charity. 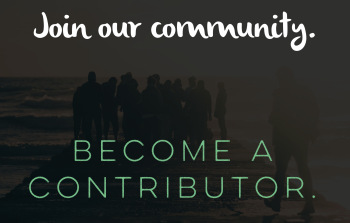 Michael’s work has been published by The Associated Press, The Guardian, The Huffington Post, Fodor’sTravel, Citi Bank, Sprint, and Uber to name a few. He currently splits his time between Brooklyn, NY and Pittsburgh, PA.